Ever since making the creamed spinach, this has been my favorite breakfast. Wait, no, not my favorite breakfast… my favorite meal (because I can’t pretend that I haven’t made this for lunch and dinner too). I keep tortillas in my refrigerator at all times because quesadillas are one of those magically versatile dishes that you can make out of anything left over in your fridge. I usually buy the “main” brand of tortillas that come in a pack of either 8 or 10. Las time I was at the store, I found an “off” or “more authentic” brand of tortillas that were the same price per pack yet contained 20 tortillas! If you can go to a grocery store in an area that has a high Latin American population, you’ll probably find more tortilla options, many of which will be less expensive than the main American brand. 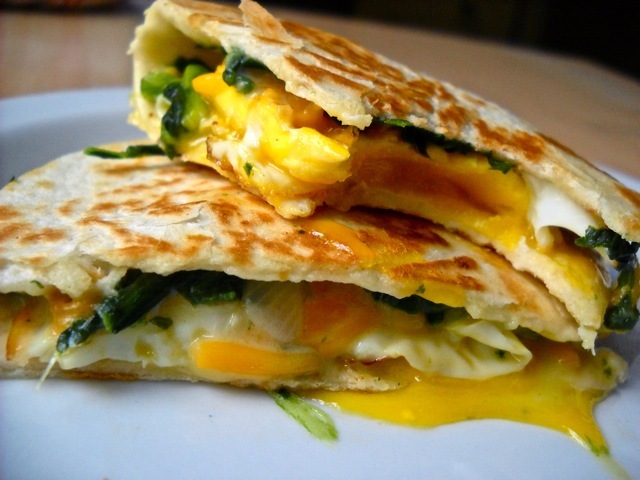 Breakfast will never be the same after these Egg Florentine Quesadillas! They're rich, creamy, quick, and filling! In a small skillet, fry the egg. 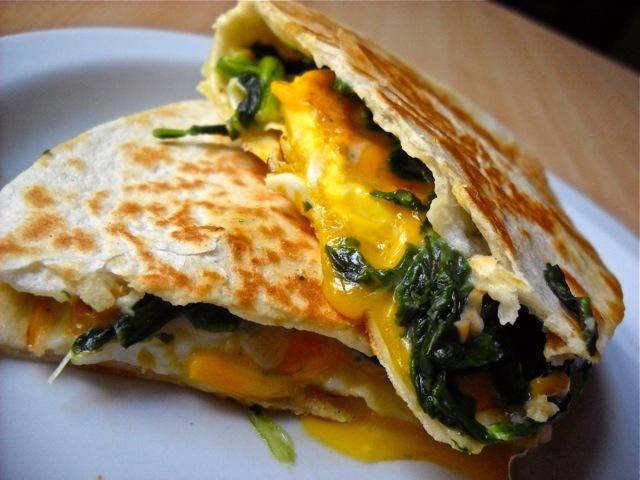 I really like runny yolks, especially in this quesadilla because of the way the yolk mixes with the creamed spinach and melted cheese. To accomplish this, make sure your skillet is nice and hot before adding the egg. Fry it on one side until the whites are mostly set and the yolk is still runny. Briefly flip the egg over and fry for 30 seconds or so. This will finish setting the top of the whites and create a skin on top of the yolk leaving the inside still runny! YUM! Spread the creamed spinach (it’s okay if it’s cold from the fridge) over one side of the tortilla. Sprinkle the 2 Tbsp of cheddar cheese over the creamed spinach. Place the cooked egg on top of both and fold the other side of the tortilla over top of the fillings. Place the folded tortilla in the hot skillet that you used for frying the egg (keep the heat on). Cook the quesadilla on each side until it is golden brown and crsipy. Serve immdiately! NOTE: Even if you can’t find the incredibly inexpensive 20 pack of tortillas like I did, this dish is super inexpensive. Another variation that I made was to spoon a couple dollops of homemade marinara in there with the rest of the fillings. The tomato flavor mixes wonderfully with the creamy spinach, egg and cheese. You could even use the marinara as a dip instead of salsa like regular quesadillas come with. I love quesadillas! These were so good! My husband loved them too. I added some sliced tomatoes on top and had them for dinner last night and lunch today. They were surprisingly filling! Beth, I just wanted to let you know that this has become my go-to breakfast on the weekend. It is so delicious with potatoes with a little paprika and some fruit! I tell all my friends about your website. Thank you for all the wonderful recipes! I just made this along with the creamed spinach, and I have to say that cheese isn’t necessary! The spinach filling was very thick and creamy, and tasted almost cheesy on its own… Unless you’re really into cheese. Then load up on that cheddar. This is fantastic, although it’s also the drippiest quesadilla I’ve ever met. Delicious. I made this this morning and really, it’s delicious. It is a fantastic, restaurant-quality dish, and only 63 cents? Such a deal. This looks phenomenal. I am in a fried egg phase so I will have to try this! What a great idea for a quesadillas!